the story of the oculus rift. “DIY” or “Do It Yourself” has become a popular trend in our current culture. From makeup tutorials to online classes, there are now infinite possibilities for choosing how to learn a skill or make a modification. The Oculus Rift epitomizes this trend as it is a user assembled device, thus making the user an integral part of the device itself. In addition to the “DIY” aspect of the device, the Oculus Rift is also a demonstration of the current social investigation of the understanding of human consciousness and its boundaries (Ebsersole, 1). In this avenue, virtual reality has been compared to the ancient practice of meditation, in the sense that it exemplifies the exploration of new avenues of mind body connections. The popularity of these new avenues is shown through the overwhelming support of developers, investors and consumers that the Oculus Rift has received, resulting in 2.4 million dollars being raised through a Kickstart campaign (Oculus, 3). Even more so the role of the Kickstart campaign, further illustrates the “DIY” theme showing that individuals can build and manufacture an idea without an overarching corporate influence. The reception of those who have tried the Oculus Rift has been overwhelmingly positive, with reporters claiming it to be “the future,” likening its introduction to that of home TVs (Warren, 1). Society is no longer interested in simply watching a show or movie, there is an underlying desire to interact with entertainment. The lucky few who have tried the device, claim that the video game itself happens to be the least exciting part of the experience. As the Oculus Rift offers such a high level of visual and interactive detail, the novelty of observation becomes far more enticing than anticipated. In comparison to other forms of digital media, the Oculus Rift affects human consciousness in an unparalleled way. The Oculus Rift alters the spatial environment, which in turn, produces an effect on the body, memory, mind and consciousness of the user. With other digital mediums, like Google Glass, there is not a complete immersion in a separate reality, rather these devices create an engagement with an augmented reality. Because this is a virtual reality device, one the engages the viewer with a completely separate reality, the Oculus Rift has the capacity to expand the limits of human consciousness. The Oculus Rift is representative of the current societal quest for more personalization in settings and experience through both “DIY" alterations and the adaptive settings of the device. Moreover, the functioning of the device is representative of the expantion of human consciousness and thus the breaking of traditional social confinements of human consciousness. What can the human consciousness explore in the virtual world? The Oculus Rift is encouraging our society to ask these kind of fundamental questions about ourselves and our society. The emerging presence of the Oculus Rift signifies a new digital frontier for the questioning of human consciousness, personal freedom, and self-construction. Virtual reality has had many reinventions through science fiction books and films. However, as the phenomenon slowly becomes a part of real life, it is rapidly evolving from a vague concept to a well-designed, precise, and expensive media. Digital reality is generally a 3D space mapped similarly to a first-person shooter video game, where you can move and observe the 3D space through a head-mounted display. Companies such as Infinite-Realities do the grunt work of analyzing the real world to make it into a virtual world with multi-camera, multi-angle, and multi-lighting photography. Some virtual reality technology even allows you to walk on a treadmill in order to walk in the 3D space, creating a seamless feeling for our human perception. Virtual space is based on real space, but because it is constructed, it is completely different. For example, negative stimuli can be mostly eliminated and the importance of aesthetics become highly central. Making a solid gold palace or a wooden palace in virtual reality takes about the same amount of monetary investment — so virtual material is not the indicator of quality. Rather, it is precision, attention to detail, subtlety and artistry that will determine the value of virtual space. Many games will have to be recreated or at least adjusted, because current standards dictate the player is about 4-feet tall and the world significantly too large (Techhive). Perhaps the biggest prediction that will take many years to realize is total body immersion in the virtual space. Being able to match every perception to something in a virtual world is not yet something that has been solved. The visual aspect is an extremely challenging technology, in itself, and is still being perfected. The hardware currently has limitations such as nausea, and limited time use. Many limitations come from the head-mounted display. Some type of hardware that affects the whole body or interacts more seamlessly with the physical aspect of motion sickness (inner ear, eye movements, etc). As virtual space reaches perfection and the hardware becomes seamless, it is clear that this technology will expand beyond recreational use. Other types of media can be efficiently and easily implemented through a virtual world and because of this, applications such as medical usage, are not far off. With computers prepared to pass the Turing test in less than 20 years (Google Exec, Boston Dynamics), it is difficult to ignore the reality of the movie Her. Our virtual friends may become more intelligent, interesting, and dynamic than our real ones. The societal impact of this is unprecedented, and by perfecting environments and characters, we can improve our lives and productivity. Current research shows the value of virtual reality in treating PTSD but it can help treat other schema-related issues, where role-play or imagination was previously used. Possible problems with virtual reality include addiction, escapism, and dependency. However, virtual space is just an iteration of real space, so the problems it will exacerbate are problems we already deal with in society. Though there may be unforeseen consequences, most researchers believe the positives will outweigh the negatives. The history of virtual reality far precedes the commonly held notion of its origin. The human want for alternate, separate realities can be traced back to as far as the northern Renaissance and Baroque periods, long before the dawn of the digital world. 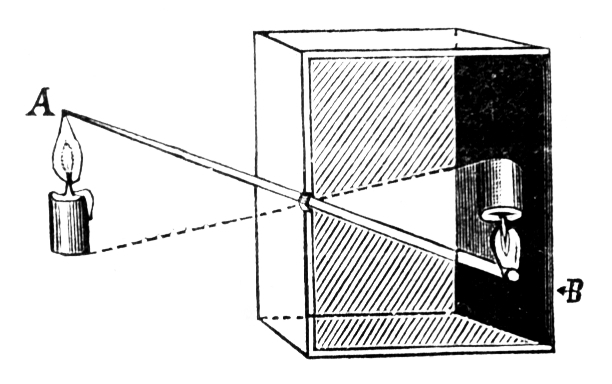 In the 17th century, it was commonplace among Dutch artists to use aids such as the Camera Obscura (a box which projected a real life image) and other facets of Keplerian optics. Art historians have often noted that artists of this era, Vermeer specially, were fascinated with painting images from the view of a distorting lens, “(recreating) the pre-ordered, pre-cognitive, visual reality” (Gal, Chen-Morris 202). This notion of an “alternate reality” has been present in art since the beginning of time, but only with the invention of technology (lenses and virtual reality modulators) has mankind been able to create devices which allow for interaction with this virtual reality. 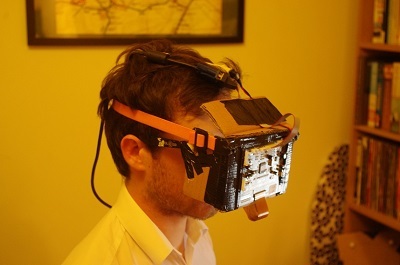 In looking at the predecessors of the Oculus Rift, it is clear that there has been a disconnect between the technological advancements and the imaginary visions of virtual reality in pop culture or otherwise. 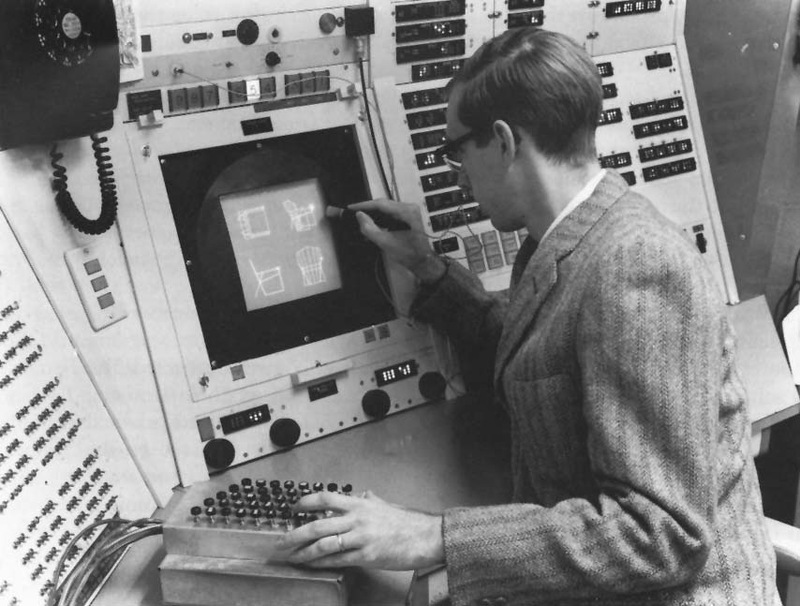 Ivan Sutherland is considered the founder of technological virtual reality with his invention of the Sketchpad in 1965 (Packer, Jordan xxiv). As the first device that allowed for interaction with virtual reality, it simply allowed an engineer to display computer data in what Sutherland described as a “mathematical wonderland” or alternate world. From this point on, virtual reality technologies slowly climbed, often lagging far behind what was depicted in science fiction. They have taken many forms, including many different versions of sensors for the body, but seem to be rooted in the idea of the “head-mounted display,” a tradition which the Oculus Rift carries on (Packer, Jordan xxvi). An important distinction to be made here is the notion that objective and naming of virtual reality is very broad. Virtual reality, as a category of industry, can refer to creating things such as “synthetic experience, virtual worlds, artificial worlds or artificial reality” (Mazuryk, Gervautz 3). Although all of these objects have more of less the same definition, their connotation and diction indicates a slightly different focus in the theory of virtual reality. This perhaps can be applied to the unprecedented success of the Oculus Rift. Compared to past virtual reality devices, the Oculus Rift has been widely well received because it is able to give the wearer a highly integrated experience between sense and the virtual world (rather than being strong in only one sector). Although the Oculus Rift may appear to be only a headset, it integrates physiological sensors, such as an in-development treadmill, to take users completely into the virtual reality (Korolov). The Oculus Rift has been so successful, even in its current prototype stage, because it has been able to build on past technologies in order to create a more seamless user experience. The Oculus Rift is a creation made possible through Oculus VR, a company founded in 2012 by Palmer Luckey, and as of January 2014 currently in the possession of a $95 million dollar budget in investments. A relatively new player in the emerging technological boom, Oculus VR is currently the only developer to produce a virtual reality component at a scale so large in influence. The company’s recent strides in product and market development have surpassed many industry expectations as it prepares for the mass distribution of a long awaited breakthrough in the virtual reality market. The narrative of the Oculus Rift began as one of Luckey’s ambitious curiosities, taking influence from the utopian technologies depicted in science fiction novels he had encountered in his youth. The 20-year-old millionaire began tailoring his vision for a sophisticated virtual reality experience by thoroughly investigating the components of virtual reality equipment he had previously accumulated. Initially, Luckey wished to produce a final result that would satisfy the niche interests expressed by a small community of virtual reality enthusiasts for a fully immersive virtual reality experience that would compliment the contemporary levels of digital content interaction. His ambitions reached a larger audience once his modified head set displays caught the interest of id Software programmer John Carmack, who was interested in a mobile version of the component. The id Software guru choose to feature an early prototype of the Oculus Rift during a demo presentation of his for Doom 3 at an E3 gaming convention in 2012. The aftermath revealed an exponential spike in interest for virtual reality software development, with many recognizing the degree of influence that this type of technology could have in the way we engage with interactive digital content, particularly in the gaming industry. The trend led to a Kickstarter campaign led by Luckey, with strong support from Valve Games which initially strived to reach $250,000 in investments. Luckey’s wonderous fascination was established into an official company in 2012 as result of his partnership with Brendan Iribe and Mike Antonov. The two experienced tech professionals signed on as CEO and Chief Software Architect, helping raise a surprising $2.4 million in initial Kickstarter investments from estblished gaming industry companies such as Valve, Unity and Epic Games. (Purchese, 1) The duo responded to the growing interest in the research and development of virtual reality projects by proposing endorsement plans to publicize and garner further support for the Oculus Rifts manufacturing and development. Iribe believes that “virtual reality is the next generation of immersion", claiming it can serve as an escape for people that have never been able to travel outside the U.S., and the most cost effective way to enhance large display experiences in general. The direction of Oculus VR received further support from seasoned tech industry veterans such as former EA games executive Dave DeMartini and Aaron Davies. As head of the Oculus Rift’s worldwide publishing, DeMartini offers a database of useful contacts to the Oculus VR rolodex in the pursuit of creating a communal ecosystem of awareness for emerging forms of virtual reality content in the gaming industry. As head of developer relations, Davies facilitates the distribution of development kits to gaming industry software developers, allowing programmers to construct combatable gaming platforms that will yield compatible with the finalized Oculus Rift software (Takahashi, 2).In the summer of 2013, Santo Politi and Antonio Rodriguez, general partners at Spark Capital and Matrix Capital, joined Oculus VR’s board of directors helping raise an additional $16 million for the company through Series A funding (Schumacher & Redner, 1) The second prototype for the Oculus Rift, dubbed Crystal Cove was well received by game developers, distributed in their development kits in late 2013 (Evangelho, 1). Its sophistication sparked the interests of Andreessen-Horowitz, one of Silicon Valley’s top venture capital firms. The investment company, renowned as a spearhead in the emerging technological industry which supports the growth of established companies such as Facebook, Groupon, Twitter, Zynga, Jawbone and Foursquare, invested $75 million in Oculus VR through Series B funding. Being one of the company’s largest investments to date, Oculus VR claims the partnership will bring in capital, experience, and credibility in a creative market where product performance predictions are often obscure. Under the leadership of Marc Andreeseen, the company believes it can “accelerate the development of virtual reality hardware, software and services” and produce a final consumer version of the Oculus Rift for summer 2014 for $300 (Schumacher & Redner, 1). Andreessen-Horowitz’ currently applies political advisors into its executive artillery, such as former U.S. Secretary of Treasury Larry Summers in 2011 (Fielding, 1) and past mayor of Washington D.C. Adrian Fenty in 2012, in its efforts to expand the global markets for the companies it invests in, with reverence to local and federal government policies (Tam, 1). This direction is predicted to greatly support the company in its efforts to deliver a comfortable full immersion experience that can alter the traditional design frame of gaming platforms, on a mass level. As the creator of a distinguished product, Oculus VR looked towards patenting possibilities that would both specify and protect their use of positional sensoring and user biological input in its efforts for maximized “obstacle avoidance”, however this may prove difficult as there are currently pre-existing patents on distortion and latency corrections and head tracking (Hurley, 1). In the 18 months since its debut, Oculus VR has experienced and exponential growth in development, having sent out 40,000 developer kits to virtual reality programmers and enthusiasts as of February 2014 (Takahashi, 4). The company has based its headquarters in Irvine, CA and is currently establishing locations in Dallas, TX and Silicon Valley by the end of the year (Schumacher & Redner,1). The company’s developments in virtual reality have complimented the growing fascination with digital experience, creating many opportunities for virtual reality technology to integrate itself into many areas of our social spheres. For example, sectors of Homeland Security are considering airframe candidates for “surveillance and remote sensing expansion capabilities (Heneghan, 1). NASA’s Human Interfaces division is currently combining the positional and rotational tracking developed by Oculus VR, in its attempts to manipulate mechanized robots in space exploration from earth (Jackson, 1). In both cases, virtual reality technology is utilized to enhance efficiency, hinting at a potential for it to “redefine fundamental human experiences in areas like film, education, architecture and design” as explained by Andreessen. The achievements of Oculus VR hold their place within the context of the grand technological developments we have observed in the past 20 years. With the level of attention and notoriety that the company has received one may ask what is next? One might find that Luckey would be the most qualified to answer this question as he divulges that 3D input and output systems hold the potential to revolutionize design, an outcome that is at the core of Oculus VR’s aspirations. 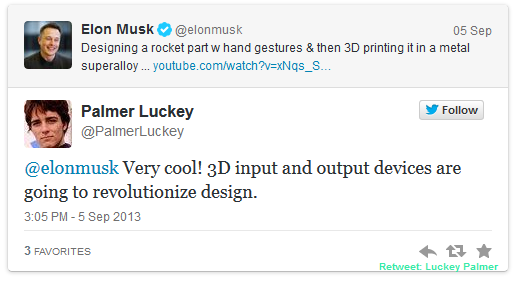 To the left, Luckey responds to Elon Musk (founder of PayPal and Tesla Motors) through a re-tweet, commenting on the potential influence of 3-D in design. Here, Oculus Rift technology is applied to military intelligence operations, in an effort to increase overall project efficiency. This is an example of developing applications of the device. The Oculus Rift is an emergent technological device that aims at finally giving consumers the virtual reality experience in the form of a mounted headset. If one disassembled it, he or she would see it is comprised of different parts that, once assembled, appear to be a pair of unique-looking ski goggles. Broken down, it is made up of a LCD screen, a LVDS cable, a LCD LVDS control board, three types of lenses to accommodate for differences in vision, and of course, the goggles themselves (Lang, 1). Altogether, these produce a headset that immerses you into a virtual reality experience. However, in its original conception, problems arose with motion blur and the lag time between actual body movements and these movements transpiring onscreen. Because of this, it was later re-introduced as the ‘Crystal Cove’ in 2014 after undergoing some vital renovations. It now boasts some additional components, like sensors to monitor body movements and a camera to eliminate blurred vision due to motion (Saltarin, 1). One benefit of the materials used to create the Oculus Rift include their relatively cheap price, which has been an obstacle for many virtual reality headsets that have been created in the past. The LCD screen, control board, and other components of the Oculus Rift are similarly found in smartphones and tablets, and China is already mass producing these smartphone and tablet parts on a consistent basis. This enables consumers to purchase the Oculus Rift at a significantly reduced price (Wingfield, 1). assembled by users, arguably making this device a part of the larger Maker Movement circulating in our society today. The Maker Movement refers to the increasing amount of do-it-yourself practices that are being applied to technological innovations. These highly complex technologies that are being created are then made to be easily reproducible by others using a commonly shared manual or developing kit available to many (Janssen, 1). With its current status as a user assembly device, the Oculus Rift emphasizes assembling your own reality. Fitting together the lenses with the headmount and putting all the pieces together is allowing the users to play a role in their virtual reality experience. With users being able to see what makes up their VR device, they are familiarizing themselves with the materiality of the device. Materiality allows individuals to tangibly visualize a digital device, and gives people the ability to see what is it at stake in the digital world. The concept of controlling your own world in a virtual dimension also parallels to the computational metaphor, which is the idea that humans and computers think on similar terms, and that computers actually “think” like humans. When one enters the digital realm, they are syncing their movementsthoughts, and abilities to the computer, acting as one brain and one controller. The Oculus Rift successfully enables users to actively play a role in assembling their own reality, a feature that holds many opportunities for one to explore the perceptions of space and interpretations of reality. Historically, people expressed curiosity over alternate realities through art, and with technological advances in this age, exploring a virtual reality became possible. 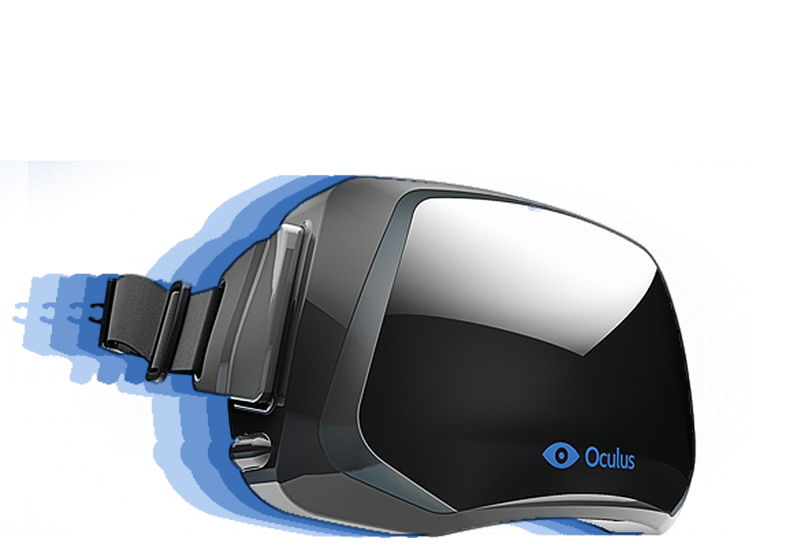 The company behind the Oculus Rift, or Oculus VR, began with a desire to produce a VR headset for the gaming industry. Since then company has witnessed an exponential rate of growth, continuously fostering positive investor-developer relationships and creating a device that brings VR technology cheaply to the consumer. Through self-assembly, the Oculus Rift is part of a larger Maker Movement, allowing itself to become a conversation piece in the emerging dialogue of utopianism, globalization, materiality of digitalism in the 21st century. Etherington, Darrell. "How Oculus Plans To Be Riding High When The Virtual Reality Wave Breaks." TechCrunch. TechCrunch, 13 Dec. 2013. Web. 1 Feb. 2014. "Happy Go Luckey: Meet the 20-year-old Creator of Oculus Rift." Eurogamer.net. N.p., n.d. Web. 31 Jan. 2014. Miro. Components of the Oculus Rift . 2013. Photograph. I Fix It OrgWeb. 10 Mar 2014. Ofer, Gal and Raz Chen-Morris. “Baroque Optics and the Disappearance of the Observer: From Kepler’s Optics to Descartes’ Doubt.” Journal of the History of Ideas 71 (April 2010), pp. 191-217. Packer, Randall, and Ken Jordan. Multimedia: From Wagner to Virtual Reality. New York: W. W. Norton & Company, 2002. Print. Palmer, Luckey. Twitter. N.p., 2013. Russell, Kyle. "Check Out The Virtual Reality Headset That Just Raised $75 Million In Funding." Wingfield, Nick. "A Matter of Perception. "The New York Times. The New York Times, 17 Feb.
2013. Web. 28 Feb. 2014. All images are fair use. About: In our approach to the project, we were excited to discuss the topic of virtual reality associated with Oculus Rift and decided to explain the topic of assembling your own reality. This direction led us to discuss the rising trends in meditations and introspection. Hayley took charge of discussing the media and cultural reception of virtual reality as a newly emerging luxury .Noemi took the liberty of taking charge of mastering the design concepts for the project as she was the most experienced in HTML. She incorporated this skill into our scroll kit narrative. Noemi also wrote our discussion of the theoretical implications of virtual reality and its effects on the brain. Tori took on the task of researching past prefigerations of virtual reality devices and how this impacts the sucess of the Oculus Rift. Alex discussed the corporate background of the Oculus Rift; regarding its initial popularity within the gaming industry and its connections to Silicon Venture capital. Ryann wrote our conclusion and did research about parts component of the device. In our project, we aimed to highlight the DIY aspect of the device and its impact on society. With our research we found many surprising facts regarding the history of virtual reality, and its growth from a mere concept, to reality in todays age.